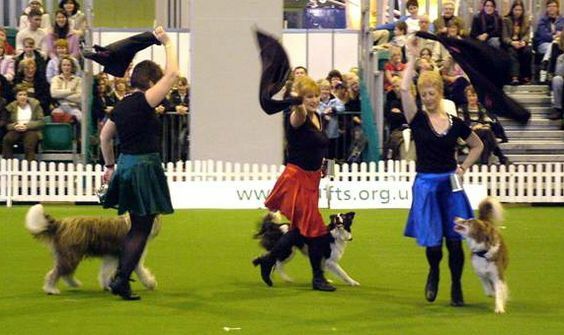 The Canine Freestyle Team is a group of three of the top handlers in Europe who have won more advanced classes in Competition than any other group. 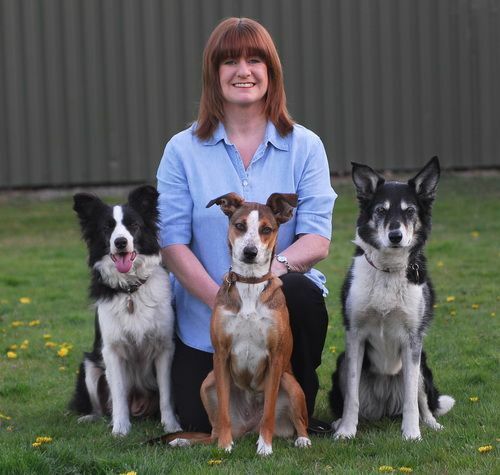 They have travelled the country from Cornwall to the Orkneys with their 8 dogs performing at many events and have also become recognised internationally as judges and presented their excellent training seminars both at home and abroad. 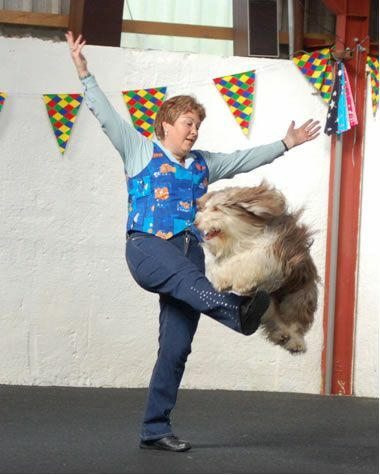 Canine Freestyle, sometimes known as Heelwork To Music, is a sport for those who love dogs and music. The dog and handler team choreograph their performances to a variety of music, illustrating their training and joyful relationship. Watch for the dog moving to the beat of the music, you will see graceful and intricate manoeuvres performed with precision and artistry. Every movement is accomplished through the subtle use of verbal cues and body language. 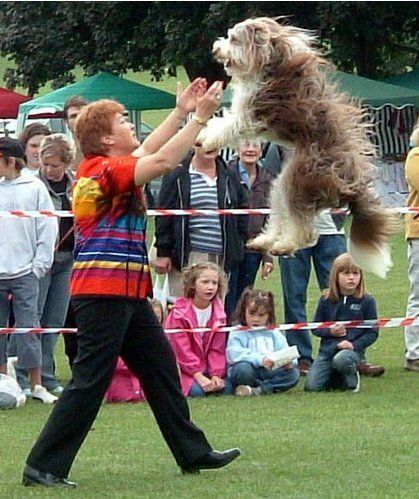 Freestyle is also an excellent discipline to illustrate the conformation and movement of the dog. The reach, drive and beauty of an athletic, trained dog moving to music can take one’s breath away. 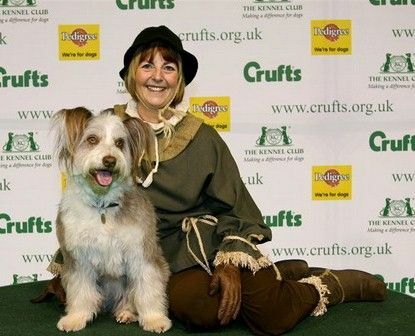 The Canine Freestyle Team won the Crufts Canine Freestyle and Heelwork To Music Finals at Crufts in 2008, the largest dog show in the world. 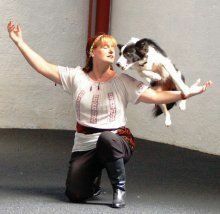 Again in 2011, Kath from The Canine Freestyle Team won the FCI World Championship for Heelwork To Music in Denmark with her 5 year old Border Collie. One team member with her Crossbreed ‘Spice’ won the Canine Freestyle Competition and another with her Working Sheepdog ‘Fly’ equalled this by winning the Heelwork To Music Final. Furthermore, handler and ‘Spice’ represented England in the International Freestyle Competition beating ten other countries including Germany, Denmark, Finland, Belgium, New Zealand & the Netherlands. 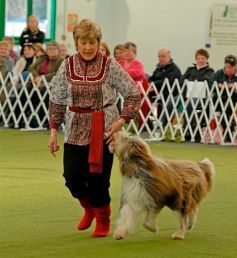 Between them, they qualified all of their five dogs which represented 25% of the total finalists places. 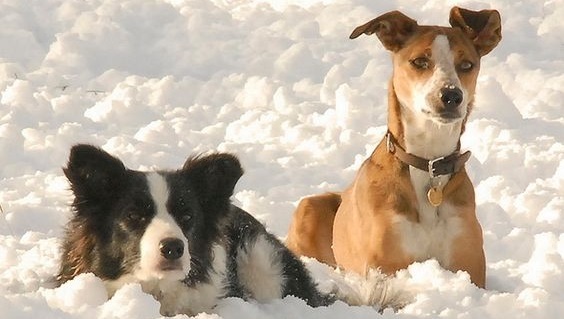 An incredible achievement for these accomplished training buddies! 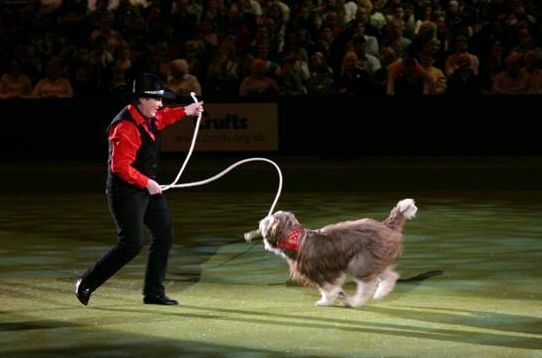 The Canine Freestyle Team and their talented dogs have given sensational performances throughout the UK and Europe. They have also travelled to Israel, Japan and USA to promote the sport further. They have performed in a production at Shakespeare’s Globe Theatre and made many live media appearances: ITV ‘This Morning’, ITV ‘Brilliant Creatures’, ITV ‘Animal Road Show’, Channel 4 ‘The Richard and Judy Show’, Channel 4 ‘Faking It’, BBC ‘Blue Peter’ and local radio stations. Standard Length of Performance: 2 x 30 mins sets. A roped off arena of minimum 20m x 20m or up to 35m x 35m. Parking area of 10m x 10m for one vehicle and marquee to provide cover from sun or rain for the dogs. Area can be fenced to ensure safe for the dogs. Parking area to be adjacent to the performance area due to quick change of handlers, costumes and dogs. A break between performances of at least 90 minutes to rest the dogs and the handlers.